The Giinaruaq Masks displayed in the Alaska State Library Archive Museum (SLAM) originate from the Sugpiaq/Alutiiq communities spanning the Southcentral and Western Maritime territories of Alaska, stretching from across the Alaska Peninsula, the Kodiak Archipelago, the outer Kenai Peninsula and Prince William Sound. The Giinaruaq (Ginaruaq meaning a face that is not a face) were donated by Mrs. Alyce Anderson and were found in the Old Savonoski Site, a former Native village site that was buried by ash in the 1912 eruption of the Novarupta Volcano. The dates of the masks’ creation and finding are unknown. The description continued to state that “after use, masks were often broken, burnt, or hidden away in caves. This was a way of removing the power of the mask.” Are these masks currently in use? What does it mean that they are put on display in a museum, visited by hundreds of people each day? Can a museum be sacred? 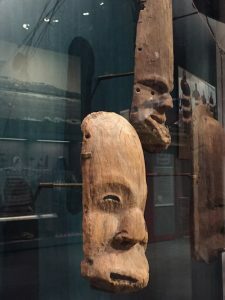 The politics behind Museums is a topic that I want to touch on in my lesson plan, thus the presence of these masks in the SLAM posed some very challenging questions for me. 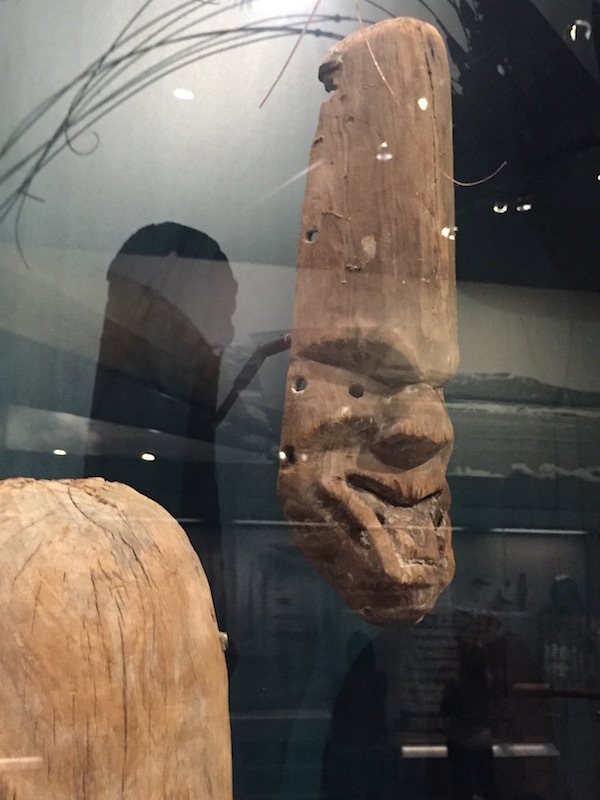 Furthermore, I am curious about the function of these masks, which was broadly described to be for ceremonies involving funerals, celebrations, pre-hunting rituals, etc… Do the functions determine the artistry of the Giinaruaq? How do the physical features of the masks connect with the spirituality and values within them? I hope that throughout the development of my lesson plan, I will be able to explore these questions in depth. Your artifact choice is great. “A face that is not a face?” Cool. I’m intrigued by this already and want to learn more. Fun fact: I used to HATE museums (admits me, anthropology major). It was not until I also became intrigued by the politics of museums that I am fascinated by them. In fact, we stand to learn nothing from museums unless we investigate these factors: why is this here? What intentional message is being sent, to whom, by whom? Who is FUNDING this? Thanks for sharing about this Chris!